"Blessed.... she gives life, and makes the earth a more beautiful place to be"! Fully sculpted in Quality Polymer Clay and entirely hand painted with fine acrylic washes our Beautiful Himba Tribe Woman stands approx. 16" tall. Her traditional tribal clothing is made from leather & carefully aged cloth. Her eloborate jewelry is all hand made from tiny silver and glass seed beads. Her hair and headdress are both very traditional representing the red mud of this tribes rivers... 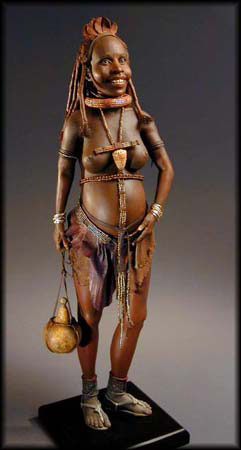 Her gourd is made from air dry clay.